Highly fashionable circle time ideas, workshops, outdoor activities, crafts, and special days to enjoy with your group of children. Perpetual calendar-Daycare closed, educa-decorate, word flashcards, activity sheets, dress-up dolls, coloring pages, and so much more! (Open thematic poster-Fashion) Print, laminate, and display all kinds of posters. 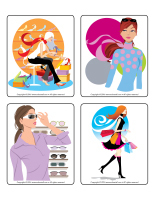 (Open educa-decorate-Fashion) Print, cut out, and laminate. Use the items to decorate the walls of your daycare and set the mood for the theme. Hang a clothesline within your daycare and use clothespins to hang colourful clothing items. If you wish, you could use children's change of clothes to see if they will recognize their items. 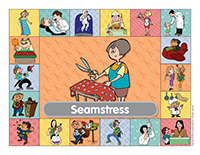 (Open poster-Seamstress) Glue the poster on your thematic bin or use it to decorate your walls. Your bin could contain spools of thread (different colors), empty spools, rulers, sewing chalk, buttons, fabric scraps with different textures, elastic, tracing paper, clothing items, a toy sewing machine, sewing boxes with several sections for the storage of sewing tools, Velcro, scissors, large plastic needles, zippers, books and catalogues with pictures of clothing items, thimbles, etc. This document was created in response to a special request received. (Open perpetual calendar-Daycare closed) Print and display to inform parents of daycare closings. Collect several different clothing items and place them in a large suitcase or chest. Deposit it in the centre of your daycare. Children will without a doubt ask you questions. Use their questions to introduce your theme. Wear highly colourful and eye-catching clothing items. With your group, identify different types of clothing. Explore fabrics, colors, shapes, patterns, etc. (Open picture game-Fashion) Use the pictures to decorate your daycare or to spark a conversation with your group. Print, laminate, and store the pictures in a Ziploc bag or in your thematic bin. (Open stationery-Fashion) Print. The stationery can be used to communicate with parents, in your writing corner, or even to identify your thematic bins. 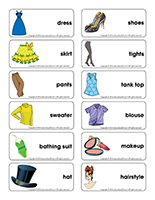 (Open writing activities-F like fashion) Print for each child or laminate for use with a dry-erase marker. 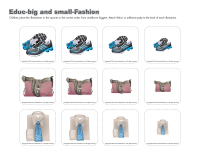 (Open activity sheets-Fashion) Print and follow instructions. (Open observation sheet-Letter P) Print for each child or laminate for use with a dry-erase marker. Encourage children to identify and circle the letter P.
Add fabric pieces to your blocks. Empty spools can be used for constructions of all kinds. Stencils for tracing clothing items. Fabric scraps can be used for a painting activity (roll them up in a ball and dip them in paint). Yarn can be used for painting or collages. Children will love drawing on old white t-shirts. Transform your play kitchen to represent a laundry room. Use cardboard boxes to make your own washer and dryer. Add a pile of children's clothing. Children will have fun sorting laundry and folding clothes! A toy ironing board and iron. Install a clothesline in your daycare and provide colourful clothespins children can use to hang doll clothes. A toy sewing machine or an old machine that no longer works (electrical cord removed). 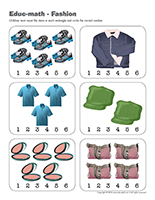 A memory game involving clothing items. You can make your own by gluing illustrations on construction paper sweater shapes. Memory game, lotto game, or other board game involving clothes. Association game where children must associate clothing items to the correct season. Modeling dough and character or clothing-shaped cookie cutters. 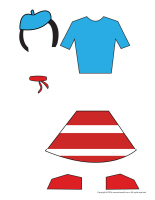 Puzzles representing seasons or different sports that require specific types of clothing. Simple lacing or sewing activities. Books about different professions so children can discover uniforms. 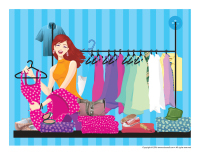 A poster showing various types of clothing. Large blankets or pieces of fabric children can wrap themselves in. 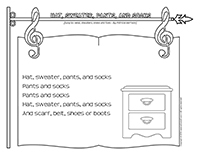 Songbook filled with songs about clothes. Water table with dolls and doll clothes. Children can wash the clothes. Sand or cereal bin with figurines representing different professions (uniforms). Dye pieces of white cotton using different well-known ingredients (red cabbage, dry mustard, blueberry juice, etc.). (Open sequential story-Clothing) Print, laminate, and cut out. Children must place the illustrations in the correct order. Collect clothing items in different sizes and styles. Encourage children to try to put the items on and explore and manipulate the various fabrics and textures. Gather the winter clothing items (or shoes) of all the children in your group. Set them on the floor, in a pile. Invite babies to search for the items that belong to them. Paint children's faces and style their hair (in a silly way). Encourage children to look at their reflection in the mirror. Don't forget to take plenty of pictures. Each child picks a partner. Invite them to take turns applying makeup to their partner's face. Collect shoes (laces), shirts (buttons and snaps), coats (zippers), etc. Encourage children to practice lacing, buttoning, snapping, and zipping. Set a large pile of clothes at one end of your daycare. Children must run to the pile, select a clothing item, put it on, and run back to the start. 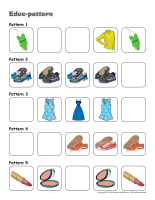 This activity represents a great way to help children practice dressing themselves. If the clothing item a child picks has buttons or a zipper, simply encourage him/her to do the best he/she can. (Open colored socks) Print. Give each child a sock. Make sure two children receive a sock of each color. For example, two children will have a blue sock, two other children will have a red sock, and so on. 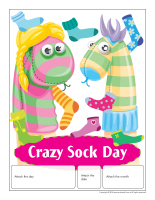 Invite children to perform various actions by calling out a sock color. You may say, "Red socks meow like a cat and yellow socks hop like a frog." This activity will help children work on their color recognition skills and provide them with the opportunity to be active. Each child picks a partner. One child from each team becomes a fashion model while his/her partner becomes a fashion designer. The fashion designers dress their model with items from your costume bin. Invite your young fashion designers to present their model to the group before reversing the roles. Touch a child's sweater, pants, or arms with a magic wand. He/she must name the corresponding clothing item. 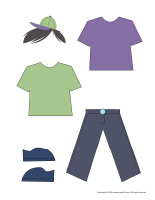 To make this activity more difficult, you can ask children to name the color of the clothing item too. Set a large white paper banner on the floor with 2 or 3 plastic bins (for dishes). Pour a different color of poster paint in each bin. Collect old shoes and invite children to wear them to step in the paint and then walk on the paper banner. Observe the tracks left behind by each type of shoe to identify differences. During summer months, organize a bathing suit fashion show. Children will enjoy walking around the yard like fashion models. Hang a clothesline in one corner of your yard. Set a large container filled with water nearby. Let children "wash" dolls clothes or old clothing items and hang them on your clothesline to dry. Ask parents to find a hat they can decorate with their child to make it a special "family hat". You can set a large bin containing various arts & crafts materials they can use to decorate their hat in your cloakroom. Invite them to pick the items they prefer. Display the family hats on a wall within your daycare. If you wish, have parents vote for the most original hat. 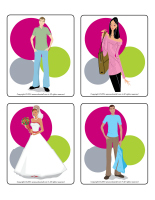 (Open educ-big and small-Fashion) Print the game and cut out the cards. Children must place the items in the correct order, from smallest to biggest. (Open hunt and seek-Fashion) Print and laminate. Children pick a card and search for the item in the scene. (Open educ-pattern-Fashion) Print and laminate. Children must use the cards to complete the different patterns. 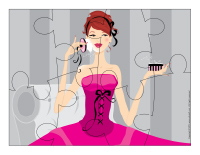 (Open puzzles-Fashion) Print, laminate, and cut out. Children must use the pieces to recreate each scene. (Open educ-math-Fashion) Print and laminate for durable, eco-friendly use. Children must count the items in each rectangle and circle the correct number. (Open memory game-Hats) Print two copies. Laminate and cut out the illustrations and glue them on the tops of frozen juice cans. Arrange them upside down on a table or on the floor. Children try to find matching illustrations. (Open game indoors and outdoors) Print and laminate the pages representing "indoors" and "outdoors". Associate the clothing items represented by the theme's word flashcards to where they are worn, indoors or outdoors. Use adhesive putty to stick the word flashcards on the corresponding page. (Open colored socks) Print. Glue the socks on construction paper (single color) and laminate them. Place the sock illustrations face down on the floor. Children take turns trying to find matching socks. Store this game in a small shoebox and leave it in your manipulation or relaxation area. Laminate pictures of different types of clothing items. Use a hole-punch to make holes around the contour of each one. Children thread a colourful shoelace through the holes. Provide several different types of clothing items and fabric scraps along with scissors, a measuring tape, thimbles, etc. Invite children to pretend they are seamstresses. They will have fun "repairing" and "sewing" the items. Older children can cut fabric, remove buttons, etc. (Open dress-up dolls-Fashion) Print and laminate. Invite children to use the various items to dress the paper doll as they wish. (Open dress-up dolls-Tales) Print and laminate. Invite children to use the various items to dress the paper doll as they wish. (Open dress-up dolls-Cowboys and Indians) Print and laminate. Invite children to use the various items to dress the paper doll as they wish. (Open dress-up dolls-China) Print and laminate. 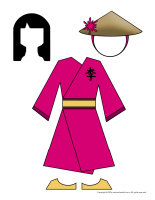 Invite children to use the various items to dress the paper doll as they wish. (Open dress-up dolls-Halloween) Print and laminate. 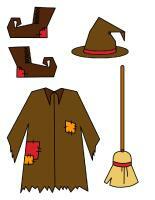 Invite children to use the various items to dress the paper doll as they wish. 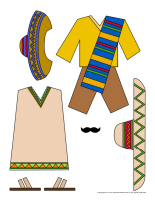 (Open dress-up dolls-Mexico) Print and laminate. Invite children to use the various items to dress the paper doll as they wish. (Open dress-up dolls-Christmas) Print and laminate. Invite children to use the various items to dress the paper doll as they wish. 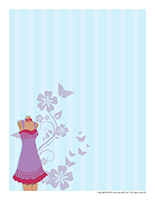 (Open dress-up dolls-France) Print and laminate. 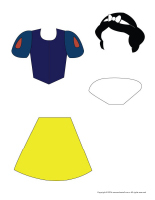 Invite children to use the various items to dress the paper doll as they wish. (Open dress-up dolls-Policeman-Crossing guard) Print and laminate. Invite children to use the various items to dress the paper doll as they wish. (Open dress-up dolls-Fairies) Print and laminate. Invite children to use the various items to dress the paper doll as they wish. (Open game-I can dress myself) Print and laminate. Invite children to use the various items to dress the paper dolls as they wish. (Open perpetual calendar-Fashion Show Day) Print and display. Greeting: Children wear regular clothing to come to daycare, but bring one or two extra outfits for the day. If you prefer, provide all the clothing items they will need for the day. Circle time: Set up chairs along a runway you have drawn on the floor with electrical tape or represented with balance beams. Invite children to walk along your runway to join you in your circle time area. Show them how they can walk like fashion models. Lunch and snacks: Drape pretty tablecloths over your tables and set a battery-operated candle on each one. Serve children as if they are in a fancy restaurant or reception hall. Special activities: Apply makeup to each child's face and style their hair. Invite parents to attend a very special fashion show. Provide high-heeled shoes children can wear. Take pictures of your group all dressed up and display the pictures in your hallway. Pretend you are a photographer all day long. Take countless pictures of the children in your group. 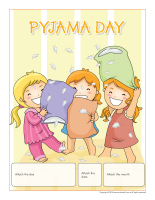 Print the pictures and use them to create a very special photo album that represents children's daily routine. (Open model-camera) Print the model. Trace it on heavy cardboard and cut it out. Each child will have his/her own camera. Encourage them to use their camera to "remember" the activities they enjoy most during the day. Before going home, have them draw their favorite activity (Open model-picture) and present it to the group. (Open perpetual calendar-Pyjama Day) Print and display. Greeting: Children wear their pyjamas to daycare. Encourage them to bring their favorite stuffed animal too. Wear your pyjamas to welcome your group and serve breakfast. Circle time: Invite children to introduce their stuffed animal to the group. You may also let each child share his/her favorite story or song with the group. Lunch and snacks: Serve breakfast for lunch and cereal at snack time. Special activities: Organize a toilet paper battle, play movies all day long, and plan a pyjama parade within your daycare. Greeting: Invite children to bring colourful socks to daycare. Encourage them to wear mismatched socks on their hands and feet. Circle time: Talk about socks and feet with your group. Lunch and snacks: Serve wrapped snack items in clean socks. Special activities: Set as many socks as possible in a large pile on the floor. Ask children to find matching socks. Make sock puppets and use them to invent a simple puppet show. 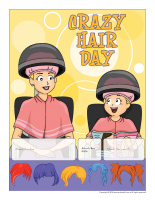 (Open perpetual calendar-Crazy hair day) Print and display. Greeting: Ask children to bring various hair accessories to daycare. Wear a wig or hair rollers to greet children. Circle time: Encourage children to present the items they brought to daycare to the group. Discuss different hairstyles while looking at pictures in magazines. Lunch and snacks: Give each child a round piece of pizza dough and let them add cooked spaghetti around it to represent hair as well as vegetable pieces to represent a face. Special activities: Fill a large bin with a variety of hair accessories. Let them use the accessories to style their hair (or a friend's hair). When everyone is done, parade around the daycare. Have fun styling the hair of your daycare dolls and stuffed animals. Provide ribbons, hats, etc. If you wish, you can also style children's hair. (Open perpetual calendar-Hat day) Print and display. Greeting: Wear a special hat and invite each child to bring an original hat to daycare. Circle time: As a group, talk about hats and professions that require wearing a hat. 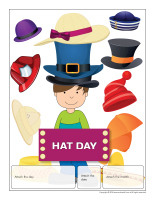 Special activities: Make construction paper hats, play musical hat, decorate old hats, etc. Greeting: Encourage children to wear black and/or white clothing items. Wear a white (Santa) or black (witch) wig to welcome children in the morning. Circle time: Paint each child's face to make them look like pandas. Lunch and snack: Play a guessing game with salt and pepper shakers. Invite children to identify black and white food items. Special activities: Have fun searching for black and white items within your daycare. Let children mix white and black paint together. Provide white chalk children can use to draw on black paper. Use the clothing items you created with your group throughout the week to organize a special fashion show. Find a name for your clothing collection. Invite parents and/or children from other daycare groups to attend your show. If you prefer, simply invite children to wear their favorite outfit. Children take turns pretending they are a photographer. The other children dress up and pretend to apply their makeup before posing for the photographer. Have each photographer draw his/her favorite "picture". Use old white t-shirts to test different natural dyes with your group. To create unique designs, use rubber bands to tie the t-shirts in a ball and let them sit in the dyes overnight. Cut the outline of various clothing items out of sugar cookie dough. Once they are baked and cooled, let children decorate them with colourful icing and candy pieces. (Open models-People) Print and cut out the models. Ask children to cut clothing items they like out of catalogues and magazines. When they have a complete outfit, have them glue them on their model. Instead of placing lonely gloves, mittens, or socks in the trash, use them to make unique puppets. Cut the tips off each finger and have children wear their glove. Draw faces on their fingertips. Decorate the puppets with yarn, buttons, etc. Give each child two empty tissue boxes and invite them to transform them to represent shoes. Use a hole-punch to make three or four holes on either side of the openings and thread shoelaces through the holes. Children will love decorating their new shoes. Ask children to bring an old shoe to daycare. Let them paint and decorate their shoe. You can have them glue wiggly eyes, feathers, and buttons on it. Set the shoes on a shelf so everyone can admire them. Give each child a brown paper grocery bag. Cut a hole in the bottom so they can wear their bag. Let them decorate their sweater with fabric scraps and ribbon. Using a large roll of paper, cut the front and back section of a pair of pants for each child. Staple the contour of both sides and cut a slit in the centre (between the legs). Invite children to draw pockets, patches, a zipper, a cuff, etc. (Open model-hat) Have children color and cut out the model. Help them assemble their hat. (Open creative coloring-Fashion) Print for each child. 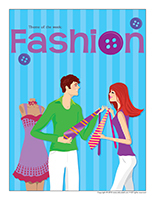 (Open coloring pages theme-Fashion) Print for each child.